The walls in the Student Cafeteria were painted by R.L. Vaserberg and Hillar Kaplan-New in 2004. Read more about campus artwork. The Student Cafeteria is located in the center of campus (room 180 on the campus map). Lunch is $3.00. Families who turn in Meal Applications may qualify for free lunch or reduced-price lunch ($0.40). Food at the cafeteria is delicious, nutritious and will not get squished in a backpack! Studies have shown that good nutrition is critical for learning, so let's make sure all our students are eating properly. Please send students with change and $1 bills, as bills $20 or larger are not accepted. Free and reduced-price lunches are available for eligible students. Some families may not realize that they qualify so be sure to turn in a Meal Application. Submit your Meal Application as soon as possible, turning the form into the Main Office (see campus map) on applying online. Additional forms are available in the Main Office or Student Services Office. See our Meal Appplications page for details. Questions? Please contact Palms Middle School or leave a message for Terri Andersen, Title 1 Coordinator. In March 2012 the LAUSD Food Services Division implemented a Point-of-Service (POS) system, replacing the use of tickets and meal cards. Students no longer lose tickets and meal cards! Students are identified by a unique Personal Identification Number (PIN). A student keys his or her PIN into the keypad at the cashier station and the cashier can identify the student based on the PIN and the school photo that appears on the screen. It is very important that students know their PIN. Please help them learn and remember it. If your child does not have a PIN, contact the school. You can deposit cash into your child's account at the cafeteria. In the future, anyone with an account will be able to pre-pay and track balances via the Internet. For further information see the announcement letter (English, Spanish). See Breakfast in the Classroom. 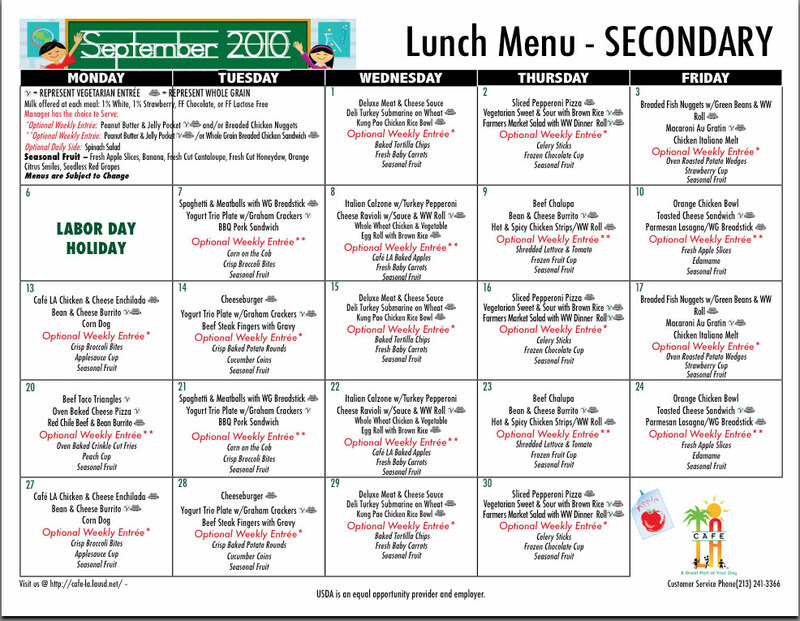 The Palms Middle School daily menu can be viewed at Schoolmenu.com. Bookmark the page for easy reference! 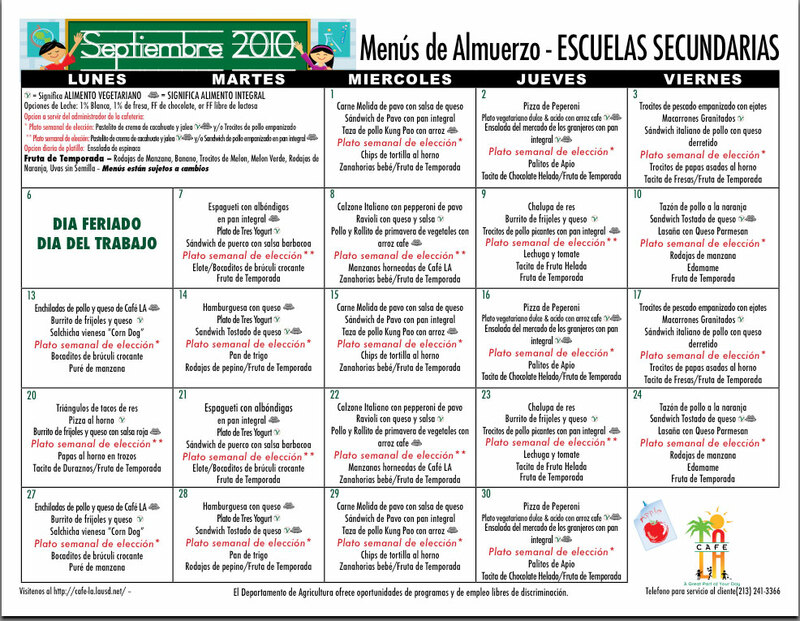 Nutritional information in English and Spanish can be found at the Café LA Menu website maintained by LAUSD's Food Service Division. If a doctor has determined that your child has a disability that prevents him or her from eating the regular school meal, the school will make any substitution prescribed by the doctor. There will be no extra charge for this service. Submit the doctor's statement, including prescribed diet and/or substitution, to the Cafeteria Manager. For further information, contact the LAUSD Meal Compliance Unit at 213-241-3366.